Tyco BMW have wheeled in Alastair Seeley to replace the injured Davide Giugliano at Oulton Park’s MCE British Superbike round this weekend. The Carrickfergus rider, who is campaigning the team’s S1000RRs at this year’s North West 200, isn’t on Supersport duty as his Spirit team takes a development break until Snetterton so will take the reins for both Superbike races. “It’s always a pleasure to come back and race for Tyco BMW and to get an opportunity to jump back into the premier class aboard an official BMW Motorrad supported S1000RR is an offer I wasn’t going to turn down. 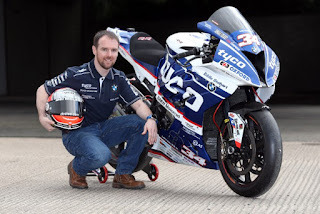 I’ve had some decent results in the Superbike class before at Oulton Park and knowing how well prepared the Tyco BMW’s are, I’ll be looking to be a decent wing-man for Christian Iddon at the Bank Holiday meeting,” he said.